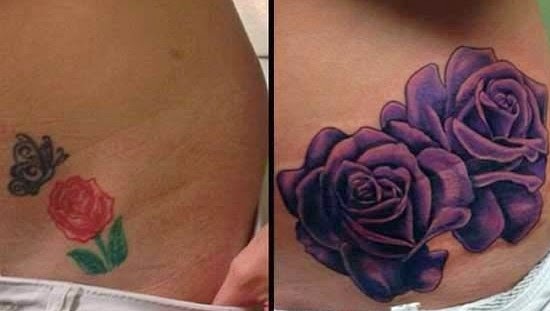 What Is Tattoo Cover Up? Let Me Tell You! Tattoo cover up is replacing an old tattoo by a new one. In fact, covering up a tattoo does not mean that you cover totally the old one; it means you mix up aesthetically both of them. You should never think that it is just painting a new one and hiding the old one, you should think about a work of art and creation. The chief thing needing remember is that the new one should be dense enough to intimidate the old one. We all know clearly that having a tattoo is not easy and sweet and so does covering up a tattoo, which is so hard, hurt and expensive. Therefore, you should think carefully and deeply before making the last decision. Let think about what is your first purposes, your values and the cost for whether trying to erase previous tattoo or having cover-up. 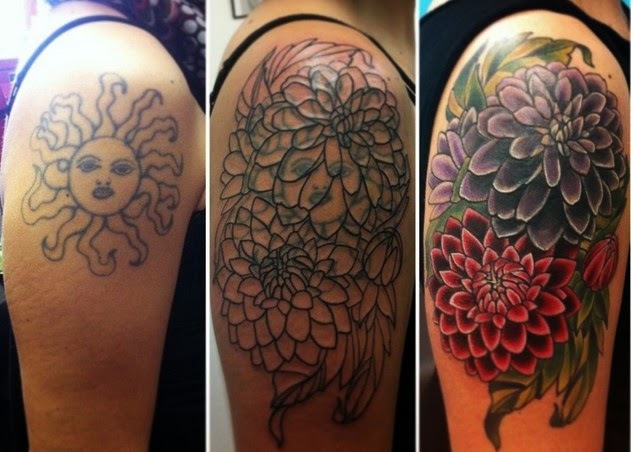 There is one thing you need to notice is that cover-up can leave shadowy or muddy look regardless of how talented your tattooist is. After having the last decision to choose cover-up to renew yourself and be different, what you can do now is looking thoroughly your old tattoo and give me the answer if it is old and week enough to be coverable. Never underestimate in this step, which if you miss, your tattoo is just a mixture of two tattoos competing space and being meaningless. Mixing them harmoniously is what you need for your tattoo cover up. I will tell you about the rule of color in cover-up. There are some tattooists make mistakes when do not know the fact that black cannot be covered by anything. So if you meet a professional tattooist, he will black first and color later. Unfortunately, your older black tattoo can be fading and turned into grey, which is tough to deal with and easily create shadow for your new tattoo. Somehow, you can use laser to treat this grey, which is like rubbing out some unnecessary details to have the best picture on yours. It Depends On Your Old Tattoo And You Will Have A Suitable New One! If your tattoo is small, you should think about a big and strong new one. If your one is so black, remember to use laser and weaken it before deciding covering up anything. You also should think about the size of new tattoo. It is obvious that it must be bigger than the old tattoo in order to have the balance between all areas of colors in your work of art. To sum up, I want to notice you that you already had a tattoo; this cover-up is your second try, you know exactly how dreadful it is, so you must be full possession of your senses, looking for as much as information about it and making the last decision. I know that this post cannot cover all ideas or experience relating to tattoo cover up, so if you find out or experience something new and interesting, share with us! Good luck with your new cover-up! Tattoos are now amongst the most popular way for a person to declare his or her self-expression or life taste. This art of body ink has a long history with many developments over the time and different tastes, as well as different styles and methods in different cultures. Choosing an appropriate tattoo artist is important to have a proud and attractive tattoo on your body. However, taking care of the tattoo is also important, as you definite never want your tattoo to fade over time, or even worse, your skin to itch and get infected from the tattoo. Not many people know how to take care of a tattoo correctly, thus getting their tattoo ruined over time or their skin infected. We make this article to help provide the correct and safe method for taking care of your body ink art. We will be discussing the steps for taking care of a tattoo in general, i.e. for the long run, and also taking care of a new tattoo for the first several weeks after it gets inked on your body. The steps are very simple and easy, and they guarantee that your tattoo will look cool and new all the time, and that your skin is safely protected from any kind of infection or damage. Step 1: Listen to your tattoo artists. They work in the fields. They have experienced hundreds of tattoos, so they know best what is necessary to take care of the newly inked tattoo and your skin. Listen to their advice and follow their instructions. Different artists have different taste and methods, but all are advised to protect you. Step 2: Apply a bandage on the tattoo. Different tattoo artists have different ideas about the type of bandage to use and how long you should keep the bandage over your skin. Follow their instructions. The bandage will protect the skin while providing the best conditions for the skin to heal. Step 3: After the bandage period is over. It’s time to remove it and give your skin more air to heal. Wash your hand thoroughly as you don’t want to get bacteria on the soft young skin. Carefully peel the bandage off your body. Be careful or you will rip the skin and damage your tattoo. If the bandage is sticky, apply a little warm water to soften it. Once the bandage is removed, you never need to wear it on again. Step 4: Gently wash the tattoo with warm water and mild soap. Extreme temperature may damage your skin forever, so room temperature or warm water is the best. Use your fingers to apply the mild soap on the skin and wash it gently. Don’t play it too rough. Step 5: Pat dry the skin with paper towel. Only pat, don’t scrub or wipe, just pat it until it dries. Paper towel is softer and cleaner than cloth towel, so they are ideal at this stage. Let the tattoo and the skin breathe fresh air for several minutes. Step 6: Apply some ointment or lotion to soften and moisten the skin. Use enough to just cover the tattooed skin. Use your fingers to spread ointment and massage that skin area. Avoid products containing aloe vera, alcohol, cortisone. Step 1: Wash your skin and tattoo daily with warm water and mild soap for the first 2 weeks. After the skin is fully healed and the tattoo is sealed, you can wash it any way you like. Step 2: Apply ointment/ lotion daily to keep the skin moist and soft. Step 3: Avoid direct sunlight for the first month. After that, you can apply sunscreen to go under the sun. Remember that direct sunlight with high UV level is very bad for your skin, let alone your tattooed skin. Step 4: Avoid soaking your skin and stay away from swimming for a month. Soaking may cause the skin to become soggy and the tattoo may fade away. Chemicals in a swimming pool are very bad for young tattooed skin. Step 5: Wear loose clothes. Tight clothes may touch the tattooed skin and infect the area with bacteria. Also loose clothes provide air for the skin to breathe and heal. Step 6: Don’t scrub, scratch or pick at the tattoo. Of course it will get very itchy, and scratching the skin only makes the situation even worse. Just let the itch go. And drink lots of water. Step 1: Follow your tattoo artists. New tattoos are very sensitive to touch, weather, water, etc. So listen to the tattoo artist and follow exactly what you are told. The artists know their services, so they know how to take care of the tattoo and your skin. Step 2: Apply a high-quality bandage over the tattooed skin to protect the skin from getting touched or damaged and allow the skin to heal. Which type of bandage to use, how to apply it to the skin and for how long will be instructed by the tattoo artist. Step 3: Remove the bandage with extreme care. Be careful at this stage because otherwise you will damage your skin and completely ruin your tattoo. Remove the bandage gently, slowly and carefully. Step 4: Wash it with mild soap and warm water. Again be very careful. Your skin and a new tattoo are still very sensitive and vulnerable. Use mild soap with warm water, and use your fingers gently to massage and wash it. Step 5: Pat dry with paper towel. Only pat the skin, no scrub or wipe. Pat it with clean paper towel until it dries and let the skin and your new tattoo breathe some fresh air for a few minutes. Step 6: Apply ointment/lotion (without aloe vera, alcohol or cortisone) to soften and moisten the skin. It also protects the skin from getting too dehydrated. Step 7: Continue step 4 to step 6 several times a day for a few weeks. If you follow the instructions correctly and thoroughly, your skin may be fully healed in just 5-6 weeks. Step 8: Avoid from soaking, exposing to direct sunlight, scratching, picking, tight clothes, sweat. These are very harmful to your new tattoo. If you want your skin to heal quickly then you need to stay away from these factors completely. Following these steps for the aftercare of your tattoo, you will be on the correct way to extend the longevity of your tattoo to the maximum and protect your skin from unwanted damage. Your skin will be in the best conditions for the tattoo and will not give you much trouble such as itch, infection, swelling, etc. Knowing exactly how to take care of a new tattoo, or a tattoo, in general, is crucial to give yourself an attractive and proud tattoo that lasts long and looks new all the time, as well as give your skin the best protection. These steps are advised and recommended by artists and professionals in body ink art. What Lotion Should You Put On a New Tattoo? If couple shirt, couple phone, couple ring,… still not enough to express your feelings to your beloved friend, who has been there for you all the time, you can think of another option: best friend tattoos, in other words couple tattoo for friends. Everybody knows that tattooing is a form of permanent marking meaningful patterns, words,… on your skin to show your youth in the most artistic light, to impress others or for other personal purposes. For the majority of people who own tattoo on their body, hidden behind the tattoo is a very beautiful story, a special meaning to that person. 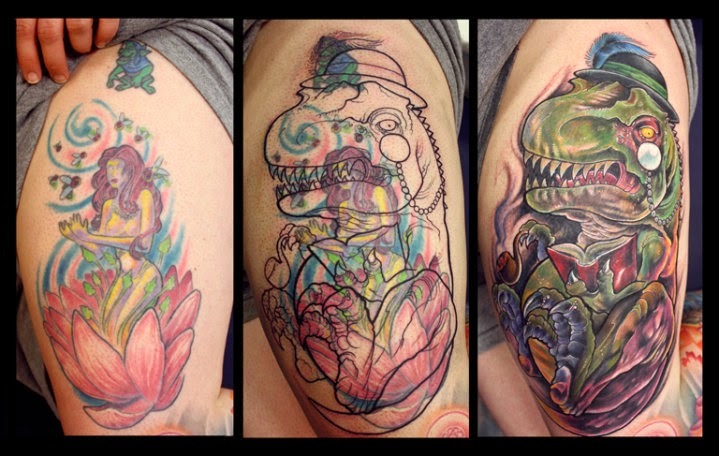 Tattoos are doesn’t only have aesthetic value, both individuality, but also long-term value. Perhaps that is why many friends want to show their friendship with couple tattoos. Best friend tattoos show a long time, deep friendship between two people that is hard to erase. We would like to introduce to you some matching tattoos that friends always pick for tattooing, not only the traditional ones but also some unique and creative tattoo designs. These matching tattoos can be used with lots of phrases, names or other symbols to design the best tattoo for friends ever. Tattoos with the infinity symbol, symbolizing for the everlasting friendship. Crosses tattoos represent for the same feeling to the other, the same faith, the same belief, the same religion. Tattoos with the word “love” are simple yet still meaningful. Tattoos on fingers are now more and more favored by young people. Broken heart shape tattoo for best friends: people often have this tattooed on the back of their hand, so when they hold each other’s hand, the heart will be completed. It means that they can be as one as long as they are together, and their friendship stays forever. Some friends choose cartoon character for their tattoo. It can be the character that they both love. These pair tattoos are relatively small yet they can be very beautiful and meaningful if they are tattooed on the appropriate spot. Friends often choose wrist, the back of the hand, shoulders, fingers, ankles,… for tattooing. Not only girls have the tattoo created for their friendship, the boys do have, too. Their tattoo designs are formed suitably with their core: strong, manly and attractive. With enhanced aesthetic and differentiation, creations, today, tattoos carry a lot of senses; contain a personal story of the two friends. And they can confidently show off their meaningful best friend tattoos everywhere. Let your friendship be with you and to be a part of your body.